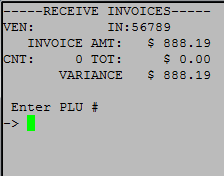 TravStar1 Point Of Sale SystemManager's Work Station Inventory ControlHow Do I Receive a Vendor Invoice With a Wireless Handheld Scanner? 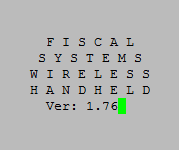 How Do I Receive a Vendor Invoice With a Wireless Handheld Scanner? 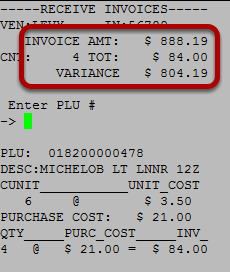 This lesson will teach you how to receive an invoice with a wireless handheld scanner. Power on your wireless handheld scanner. 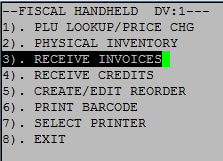 From the Fiscal Handheld menu, arrow down on the handheld until option number 3, Receive Invoices, is highlighted. Press the enter key on the handheld. 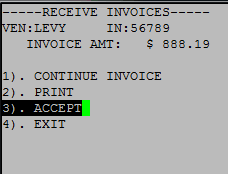 You will be prompted to select if this is a new invoice or an invoice already in process. 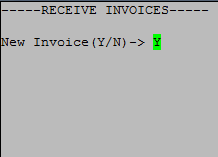 Press Y to start a new invoice or press N to be select a previous invoice. 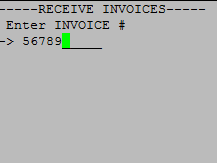 Type the invoice number on your handheld. Then press the enter key. 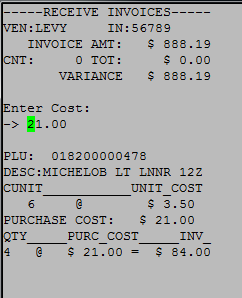 Type the invoice amount on your handheld. Then press the enter key. Note: The invoice amount should be before any shipping/processing charges from the vendor and before taxes. Hold down the scan button on the handheld to scan in an item from the invoice. You can also manually type the number in on the handheld and press enter. After scanning the first item, you will be prompted to select a vendor. 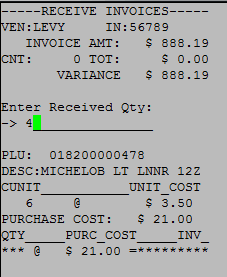 The handheld will pull up all vendors associated with the item scan., Highlight the vendor associated with the invoice and press the enter key. If the vendor you are receiving is set to use conversion , then you will be prompted to verify. Press the enter key on the handheld to verify. Note: If you do not have the use conversion unit option set under Receiving, then you will not be prompted for a conversion unit. For additional information please see How Do I Setup A New Vendor? Type in how many of the item you are receiving, then press the enter key on the handheld. The item's cost will automatically appear here. 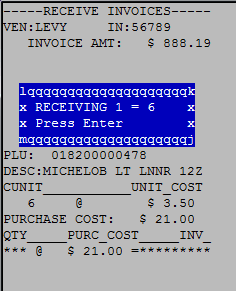 If you need to change the price you can or if the price is correct, press the enter key. 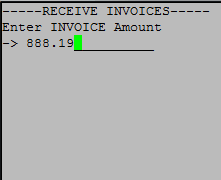 Notice you invoice total is now $84.00. 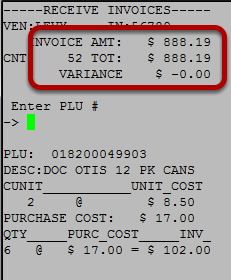 Continue scanning items on the handheld, entering quantity's, and entering cost. When you are finished entering in all items. Your variance should be $0.00. Press the enter key on the handheld. Arrow down to the accept the invoice. Press the enter key after highlighting option number 3. 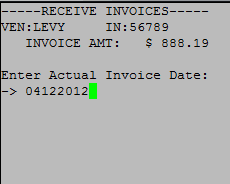 Type in the actual date of the invoice. Then press enter. The Gross Margin And Price Report will automatically print from the your Manager's Work Station's printer when you accept the invoice. 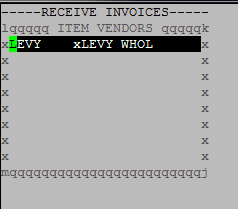 Prev: How Do I Receive a Vendor Invoice Manually? Next: How Do I Inventory the Store Without a Wireless Handheld Scanner?